So your local pro or college team donated a nice piece of sports memorabilia to your auction. You are confident that it will sell for a high price to a bidder at your auction who loves the player or team. So you snap a photo of it, label it as a “signed jersey,” and set its value and starting bid. You are sure it will go for $1,000 or more! But after the auction, you are disappointed in what you got for the item and you are not sure why you didn’t get much bid activity on it. If this is you, don’t get discouraged, we see this a lot. Having run multiple sports auctions for a number of professional and amateur teams, we have learned quite a bit about how to list sports memorabilia. We’ve engaged a sports memorabilia expert, Ray Schulte, the CEO of Schulte Sports Marketing & Public Relations, Inc., to join our team to help us and our clients get this right. Get a certificate of authenticity (COA). Unfortunately, the sports memorabilia industry has had a history of fraud. In fact, one of our own employees bought a fake Mickey Mantle signed baseball at a previous charity auction (unbeknownst to the charity). It happens. The best way to combat that is to do your due diligence to make sure your piece is authentic. If you received the item from a sports team, please ask for a COA. It normally will come with one, signed by the team or with a seal from the team. This will be a guarantee from them that the item was signed by the player. If you bought it from a collector or online, we recommend you get it authenticated by a reputable authenticator. We worked with and recommend that you use one of the following authenticators: JSA, PSA, or Beckett. It may cost you a few dollars, but in the end, you will increase the potential sale value. Besides, do you want to list an item that could be potentially fake? If you are a Pawn Stars junkie (or have even watched an episode), then you have seen this process. A customer comes into the shop with a signed piece of memorabilia. The Pawn Stars look at it, and if the item comes with no proof of authenticity, they bring in an expert. Properly name and describe the item. Was the item game used or game worn? Used items will increase in value to some because it is an indication the player touched it, and the item is authentic (e.g., not a replica). Is a COA available? If it is, you will want to state that the item is authentic. Are there any unique inscriptions in the signature? For example, does that John Elway signed football also have a “HOF 04” inscription on it? Note that in your description. If this is a signed item, take a clear close up photo of the signature! This lot contains an officially licensed Washington Capitals Alex Ovechkin Reebok replica home jersey personally autographed by the “Great 8” Alex Ovechkin. The Washington Capitals Captain signed the jersey in blue sharpie on his number 8 and included his “GR8” inscription. A certificate of authenticity from the Washington Capitals accompanies the Ovechkin personally autographed Reebok replica home jersey. Priceless is not a value; it is an emotional point of view. To some, an item is priceless, but to others (including the IRS), it is not. We have talked about fair market value and the concept of priceless in our blog post Priceless as a Value in a Silent Auction and we encourage you to read that post. That signed John Elway football, Eddie Vedder guitar, or Ovechkin jersey all have a respective value. While you may not find the exact item online, you should come close enough to approximate the value of the item. Also, while we have run into some that disagree, the signature on an object is worth something. Do your best to value the item based on what you find online. Are you struggling to find that value? Well, those same authentication services we mentioned earlier can also appraise items for you as well. There is a cost to the appraisal, but if you feel you have something that can sell, it may be worth the price. Make sure you have enough time to get the item appraised and returned before your auction! We hope these tips will improve your results on those memorabilia items you have collected for your event. If you ever have any questions about an item description or value, you can reach out to us to see if we can help. Ray Schulte, founder of Schulte Sports Marketing & PR, specializes in athlete branding, corporate appearances, licensing, marketing, signature management, public relations, social media and charitable relationships. Schulte Sports expanded its marketing consultation by working with various corporate and non-profit organizations. Clients past and current include; MLB Properties, NFL Properties, NHL Enterprises, NBA Properties, NFLPA, The National Sports Collectors Convention, KidsPeace5k, Mattingly Charities, The Purple Heart Foundation and The Industry Summit. Ray’s extensive and diverse sports / entertainment experience has him considered one of the multi-billion dollar collectible industry’s leaders which is a tremendous asset for Handbid and our clients. 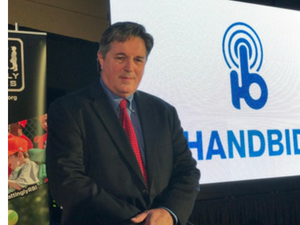 Handbid retained Ray Schulte for the purpose of providing; marketing, brand identity, public relations, collectible experience, new business initiatives and assistance with our social media engagement and promotional development efforts. We are excited to have Ray join the Handbid team!